For years, park rangers and conservationists working around Mexico's Nevado de Toluca volcano chased rumors of a monarch butterfly colony that wintered high in a forest of oyamel firs in some corner of the 132,000-acre (53,419-hectare) national reserve. Local woodsmen would report seeing some of the butterflies fluttering about and scouting teams would scramble to trek into the forest. They eventually narrowed their search to a swath of communal lands more than 10,000 feet (3,048 meters) above sea level on the northwestern side of the park, but still couldn't find the colony. "It was like an urban legend," said Gloria Tavera Alonso, a regional director with Mexico's agency for protected natural areas. Just a few days before Christmas though, a handful of communal landowners were on a routine patrol of their forest when they discovered the monarchs on a steep mountainside bisected by a dirt track far from the volcano's iconic crater. The butterflies were hidden in plain sight. Jose Luis Hernandez Vazquez, a local forester, said landowners initially worried about announcing the find. "We didn't make a big deal," he said. Instead, he contacted the agency for protected natural areas and other government stakeholders who came to confirm the existence of the colony in mid-January. At the end of last month, Mexican officials announced that the overall population of monarch butterflies wintering in central Mexico was up 144 percent over the previous year. Researchers found the butterflies occupying 15 acres (6 hectares) of pine and fir forests in the mountains of Michoacan and Mexico states, compared to only 6 acres (2 hectares) the winter prior. 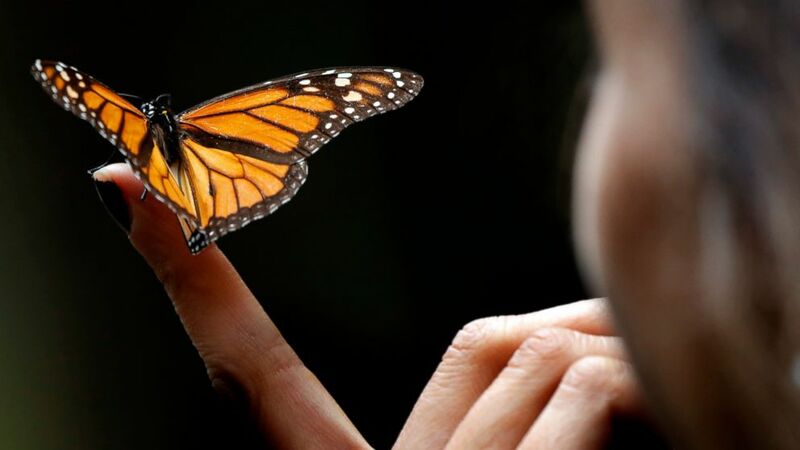 The monarch butterfly population, like that of other insects, fluctuates widely depending on a variety of factors, but scientists say the recoveries after each big dip tend to be smaller, suggesting a decline in the number migrating from Canada and the United States. This winter's population figure, however, was the largest since 2006-2007. "When the population really grows, they'll see monarchs where they don't see them in normal years," Taylor said. On a recent afternoon the air filled with monarchs as the midday sun sliced through the thick forest, leading some of the butterflies to take flight. Others lay on the ground after reaching the end of their life cycle. While some colonies are open to the public, government officials say the newly registered colony in Nevado de Toluca won't be. The reason, said Castaneda, is "so that we can guarantee lively, healthy exemplars that don't have the type of distress that in some given moment they might have with the visitors during the four-month hibernation season." Officials also want to protect the habitat where butterflies have found the ideal combination of climate, fresh water and flowers to spend the winter and mate. Without careful conservation, the danger is evident. Mexico has had success with recent efforts focused on illegal logging in the butterflies' habitat. But logging is still visible within the park, even though officials say it is carefully regulated and mainly aimed at removing diseased or wind-downed trees. Castaneda and Hernandez, the forester, are working with landowners to teach them about conservation and make it clear why protecting the butterflies' habitat is important. They also plan to form a community surveillance brigade that will be paid to keep a close eye on the new colony, which they hope will be around for many more years.